We’re taking a break from Detective Pikachu cards because it’s time for a Throwback Thursday! Though it may not seem like it, we’re continuing a series of reviews that should finally make some sense after next week… unless you already know where this is going. Surprise! Time Machine (EX – Team Rocket Returns 91/109) is an old Trainer-Item… though at the time it would have just been referred to as a “normal Trainer”. 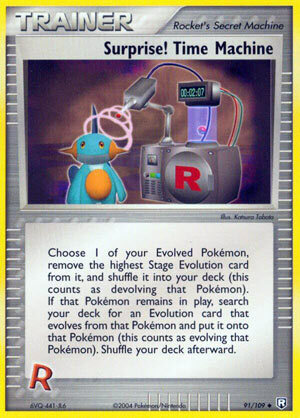 Unless someone wanted to reference its status as a “Rocket’s Secret Machine”; there were three cards with effects (all beneficial) that specifically referenced them: Dark Slowking (EX – Team Rocket Returns 9/109), Rocket’s Meowth (EX – Team Rocket 46/109), and Wobbuffet (EX – Team Rocket 47/109). Rocket’s Secret Machines had some nifty tricks, with one of them – Pokémon Retriever ( EX – Team Rocket Returns 84/109) – being Rescue Stretcher but with a different name, clunkier wording, and counting as a Rocket’s Secret Machine. The former are the predecessors of both Pokémon-EX and Pokémon-GX, but despite having a name that looks like the former they have more in common with the latter: just subtract about 15 years worth of power creep and do not give it a GX-attack. That includes being unable to use certain kinds of support and facing certain kinds of counters because of being a Pokémon-ex. Dark Pokémon can be confusing; I don’t mean [D] a.k.a. Darkness Type Pokémon, but Pokémon with “Dark” in their names, which were supposed to represent the corruptive influence of working with a Trainer who was part of Team Rocket. Though by this point, most of them were also [D] Types or dual-Types (with [D] Typing added to the appropriate TCG Typing); this further emphasized the influence their Trainers had on them and helped balance out the distribution of Types in the Pokémon TCG. There just weren’t as many [D] Types as most others in the TCG at the time, and about a year later, the δ Species mechanic was introduced – Pokémon which were the wrong TCG Typing – to balance things out even more, especially by bumping up how many [M] Type Pokémon were in the game. Getting back to Surprise! Time Machine, while things like Rocket’s Pokémon, Team Aqua’s Pokémon, and Team Magma’s Pokémon all had completely separate Evolution-lines from their baseline counterparts, Dark Pokémon Evolve from a “regular” version of the appropriate Basic e.g. the above mentioned Dark Slowking Evolves from a plain Slowpoke. Now remember the slower pacing of the game at this point; while still a relatively fast experience, most fully-evolved Pokémon were likely to survive an attack, sometimes even two. If you used some healing before Surprise! Time Machine or – more likely – just used it before your opponent could do much damage to the Pokémon in question, you created a variable assault… or defense. Something with a protective or disruptive effect could be in play (even Active) and you could shift to something with better offensive capabilities. The reverse is true as well; if you’re taking a pounding, you might be able to change to something a little more durable, assuming you could survive devolving. Though I was quite fond of this card, I’m glad I didn’t have to rate it because, while I remember using it fondly in many decks, when I glanced at some of the World Championship Theme Decks from this time, I could only find one – an Eeveelutions based deck – running it! The score for Limited may be optimistic, but since it can fake being a Full Heal, I thought it still worth it; Special Conditions are nasty in Limited Format play.